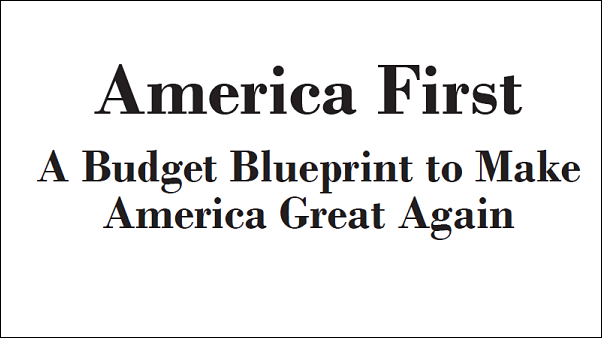 The first page of Donald Trump’s budget proposal sounds familiar themes from his campaign. The first swipe at a federal budget from the Donald Trump White House does not mention the National Science Foundation, which is the largest single funder of university-based social science in the United States. Given the cuts seen for many other federal science agencies, such as the Environmental Protection Agency and the National Oceanic and Atmospheric Administration, some have seen the omission in the budget outline released today as a blessing. NSF is not mentioned in the 62-page document, so it’s impossible to know what the new president thinks about its broad $7.5-billion portfolio of research and education. Presumably, the agency is one component of a single line labeled “other agencies” that is scheduled for a 10% cut. But NSF never received a “landing team” from the incoming Trump administration and had no interactions with White House budget officials as the so-called skinny budget was assembled over the past few weeks. While the Trump administration may not have targeted social science, that isn’t true in all quarters of the Republican majority. On March 10, the head of the House Science Committee called for favoring physical and technological science grants over social and environmental spending in a letter sent to the House Budget Committee. Such letters are something all authorizing committees do to make their budget priorities known to the Budget Committee, which uses this input to help formulate its overall budget resolution. The head of the Science committee, Texas Republican Lamar Smith, asked that 70 percent of the funding for the NSF’s various directors be sent to four of the directorates: the Mathematical and Physical Sciences; Computer and Information Science; biological Sciences; and Engineering. The net effect of this prioritization is to substantially cut the traditional levels of spending seen in the Social, Behavioral and Economic Sciences and Geosciences directorates. Such picking and choosing among the various directorates is not unknown but is unusual and generally unwelcome by scientists, and has been a hallmark of Smith’s tenure as committee chair. Smith’s letter also resurrects Smith’s focus on ensuring science grants reflect the “national interest,” which the science community often sees as a back-door for future attacks on social science. This latest letter buttresses those interpretations, as Smith writes, “Throughout its history, the NSF has played an integral part in funding breakthrough discoveries in fields as diverse as mathematics, physics, chemistry, computer science, engineering and biology.” Given that NSF-funded work in the social sciences has had an outsize impact on policy, its exclusion in this list is telling. This entry was posted in Academic Funding and tagged Lamar Smith, NSF Funding. Bookmark the permalink. Post a comment or leave a trackback: Trackback URL.